In other words, in a piston engine, the Best Power mixture is richer than the EGT peak that signs for a stoechimetric combustion. Why is that, physically ? in practical terms, running rich means that despite the unevenness of the fuel-air mix both in a single cylinder firing and across all cylinders firing and across all firings in the engine, all cylinders are guaranteed to NOT be running lean on ANY firing, which means all of them will be pulling best power on EVERY firing. In addition, there is an effect that I know about from motorcycle engines which is probably true of airplane engines and that is the "quality" of combustion as a function of richness: If you run rich, preignition and lean misfire (both of which reduce combustion efficiency) are prevented, and the delivered power is smoother. You can hear this: a motorcycle engine sounds "happier" when running rich than it does running lean- and it pulls harder, even though the mix is nonstochiometric. It's because, although the Best Power mixture dumps more fuel than can be consumed by the available oxygen, the extra fuel increases the combustion speed in the charge, increasing the buildup up of pressure in the combustion chamber, and this increases the total potential energy in the air/fuel charge that can be converted to work, even though not all of fuel is burned. You could say that the excess fuel has kind of a catalytic effect, or maybe a turbocharging effect... sort of... up to a point. 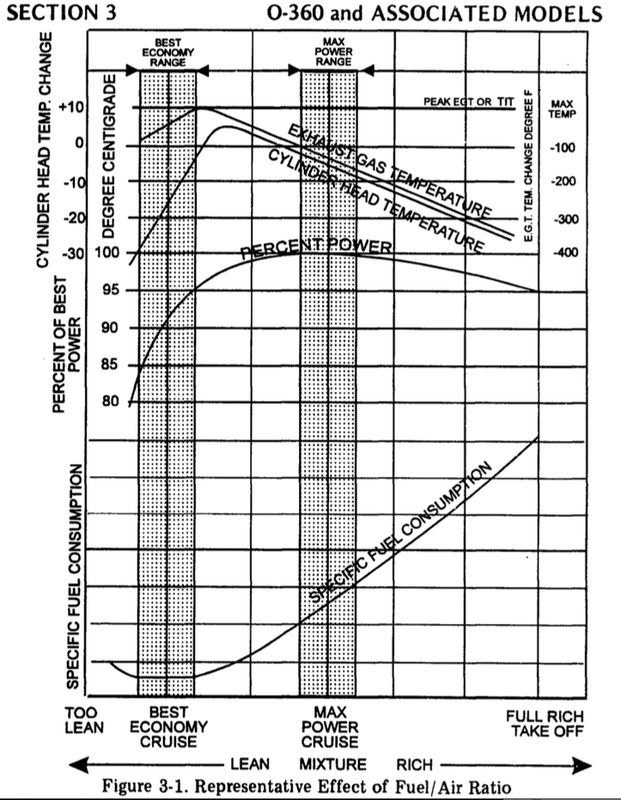 Beyond a certain point, adding more excess fuel becomes counterproductive, so Best Power mixture is the sweet spot where the speed of combustion and pressures generated are maximized and the cylinder makes the most horsepower it can make (the highest possible combustion pressure) with the available displacement and airflow. Not the answer you're looking for? Browse other questions tagged piston-engine mixture or ask your own question.